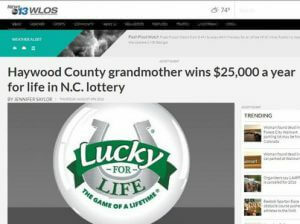 A grandmother from Canton dared to dream of being set for life, so she bought a $2 Lucky For Life lotto ticket. Brenda McCannon, however did not win the game’s top prize but she still walks away far richer after bagging the second prize of $25,000 a year for life! The lucky player later chose to receive the prize as a single payment of $390,000 which taxes pared down to $265,853 – still a great return on a $2 investment. The first thing on the winners mind is to buy a van big enough to carry the entire family!